What is a good way to clean the inside of a water bottle straw while on a multi-day backpacking trip? When coming back from a day of hiking and eating I often notice that the top of the straw of my water bottle is dirty on the inside. I've come across quite a few options to clean the inside of the straw with tools such as brushes, pipe cleaner, or a dishwasher. However, when on a multi-day hike, with only the equipment you can carry in your pack, these implements will likely not be on hand. In the past, I've drawn some water up the straw on the cleaner side and blew the water out on the more dirty side. This does help some but what I'm wondering is if there a more thorough way of getting the inside of the straw clean without the typical household items? 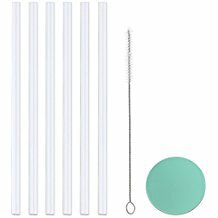 This questions assumes you didn't pack any replacement straws or little brushes, as shown below, specifically for this purpose. I would make an improvised bore snake with a piece of string or fishing line and a small piece of clean cloth and pull the piece of cloth through the straw just like you would a gun barrel. Everyone should have at least some string and something like handkerchief which you might have to cut down to size in order to fit. The other option would be to try and find a small straight stick and push a piece of cloth through but I think the bore snake idea would work better. Solution 1: Make a tool. When I played the flute I made what amounted to a shepherds crook with an almost closed loop on one end. Thread the corner of a rag through it, and draw it through the body of the instrument. You could do the same, but instead of 1/10" brass rod, you would use bailing wire, and instead of a cloth rag, I'd suggest either a scrap of sponge, or a scrap of 3M scotchbright pad. Do note: Both of these materials will pick up dirt and crud from the tube, but will be difficult to get completely clean themselves. If you are only using water, this isn't a problem. If you use something with sugar in it, then there is the possibility that mold can grow on your cleaning apparatus. Rinsing thoroughly is in order. Available at any craft store (Michaels) or some dollar stores are pipe cleaners. Originally meant for smokers to clean their pipes, they are more generally useful. Basically a stiff wire with synthetic bristles sticking out in all directions. In general I am not a fan of non-cleanable surfaces. I had a contigo coffee cup that required rinsing immediately after use (I use both milk and sugar in my coffee) Failing to do this resulted in a bad taste. After boiling the lid in bleach, salt water, stain remover, hydrogen peroxide, I was able to get some blobs of green-black slime out of it, and removed the taste. A month later, despite trying to rinse as soon as I got home each day, the taste was back. I've discarded the cup, and now have a Thermos brand one that can be taken apart when needed. Solution 3: Different water bottle. Discard this water bottle and get one that doesn't use a straw. Ignore it. It's just dust and dirt. You probably get as much dirt on any veg you pull from your garden. Not the answer you're looking for? Browse other questions tagged backpacking cleaning drinking-water or ask your own question. How to stay clean on a multi-day hike? What are good practices for resolving disagreements on a backpacking trip?